The gentle and fresh pearl-blue REhydrate Replenishing Mask is suitable for all types of skin, even the most sensitive. The micro-emulsion texture ensures optimum absorption of the active ingredients by the skin. The gel turns into a lotion for easy rinsing. The skin is left feeling soft, moisturized and soothed. Tested under dermatological control. Formulated and tested to minimise risks of allergic reactions. 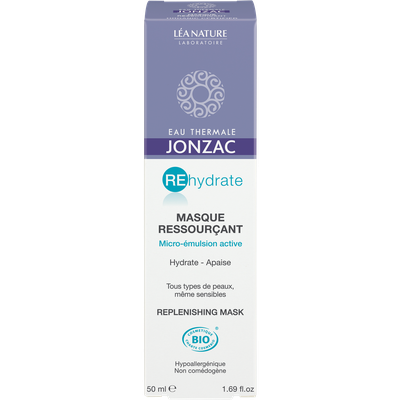 Apply the Replenishing Mask in a thick layer on the face. Leave for 10 minutes. Rinse with clean water and finish with REhydrate micellar water to remove all traces of the product. Use once or twice a week after the REhydrate gentle scrub.